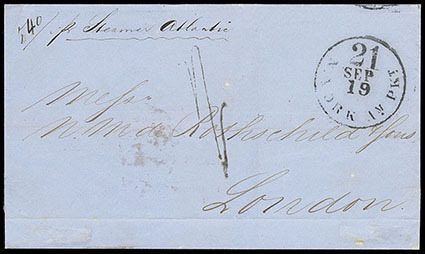 Mexico, 1872 Mexico City, Mexico to London, England, cover with "Mexico, Admon. Gral. De Correos" eagle double-oval handstamp, red "Vera Cruz, Paq. Fr. No. 2, 18 Juin 72" octagon datestamp and "FR/2F20C" oval accountancy handstamp, London (7.17) arrival backstamp and manuscript "1/-" shilling due rating, Very Fine. 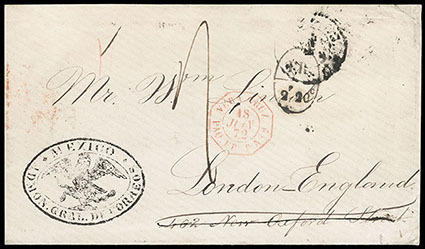 Mexico, 1855 Veracruz to London, England, folded letter sheet carried to New York with red "Forwarded by Probst & Meinertzhagen, New York" boxed cachet on reverse, carried "per Atlantic" with "N. York Am. Pkt., 21, Sep 21" exchange cds and "1/-" due handstamp applied upon arrival, Very Fine. 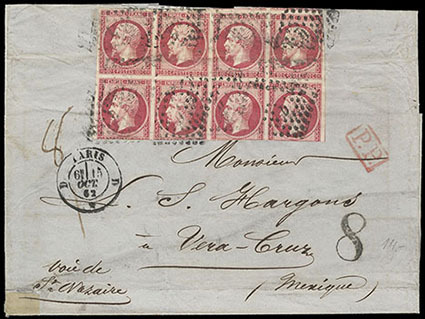 Mexico, 1862 Paris, France to Veracruz, folded letter sheet franked with France 80c Napoleon, block of 8 tied by dotted lozenge cancels, "Paris, 15 Oct, 62" origin cds and "8" inland rate handstamp; stamp flaws, F.-V.F., a rare multiple rate usage. 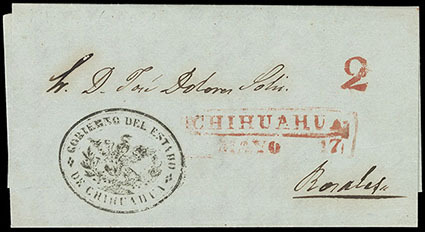 Mexico, (Chihuahua) Chihuahua, Mayo 7, red (YB CH4) framed postmark and matching "2" rating on 1856 greenish cover with oval eagle cachet handstamp, accompanied by Mazatlan cds and "Franco" wreath handstamp on 1847 letter to Vera Cruz, Very Fine and attractive pair. 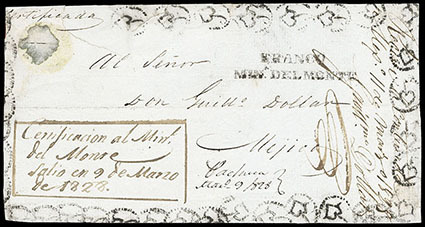 Mexico, (Pachuca) Mineral del Monte, straight line postmark (YB PA 40) on 1828 registered front to Mexico, with manuscript certification dated box and the rare "Heart" in dotted circle handstamps along edges, additional manuscript Pachuca dated transit, Very Fine and attractive, this early Republic marking was last used in the 1880's and yet it is seldom found, the mute heart handstamp is the earliest known. 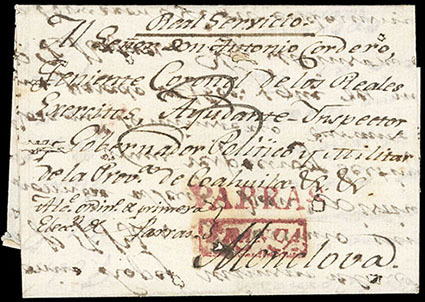 Mexico, (Saltillo) Parras, red straight line handstamp (YB ST115) and matching framed "Franca" handstamp (ST115A) with manuscript "3" rating on 1801 Spanish Period folded letter addressed to Political and Military Governor of the Province of Texas at Monclova, Mexico, endorsed by sender for "Royal Service" at top; some ink erosion., F.-V.F. 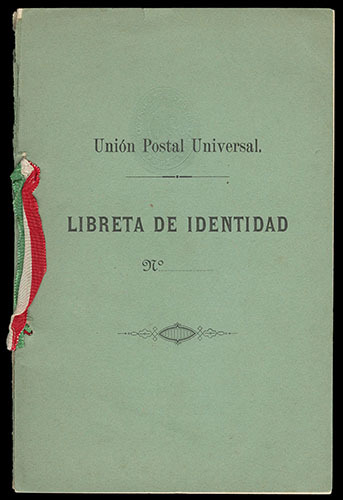 Mexico, Unión Postal Universal, Libreta De Identidad, circa 1880's, softbound, 32 pages; intact unused identity booklet for receipt of registered mail (type 2), with instructions in ten languages, includes an impression of the 20c Numeral issue on first inside page, Very Fine and choice for this, a very rare unused booklet. 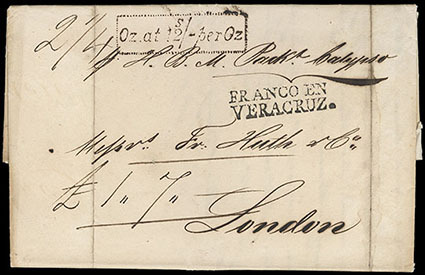 Mexico, (Veracruz) Veracruz, bold two line handstamp (YB VC7) on 1832 folded letter to London, England, endorsed "p H.B.M. Packt. Calypso" with boxed "Oz. at 12s/- per Oz" rating handstamp and "£ 1''7''" rating; some soiling along file folds, still Very Fine.